Leokadia Jaromirska lived in the Warsaw suburb of Bialoleka. One morning in October 1942, while on her way to work with another woman, they heard the cries of children and saw a little girl and an eight-month-old baby abandoned near the fence of a convent. Years later she described how they picked the children up. Leokadia convinced the other woman to take the girls home with her. After work she hurried back to the other woman's home, where she found out that the woman had panicked and brought the older girl to the police station. Leokadia took the baby home with her. "The Hand of a Child Around a Mother's Neck"
As the situation of the Jews worsened, some parents, knowing that soon all the Jews would be killed, took the terribly hard decision to separate from their children in the hope that someone would adopt them. In a desperate attempt to save their child, Golda and Gershon Jonisz left their daughter near the convent wall and returned to the Warsaw ghetto. Leokadia was childless. Her husband, Bolek, had been arrested in 1940 and taken to Auschwitz as a political prisoner. Although she was barely able to make ends meet working in a German factory, she decided to adopt the baby, whom she named Bogumila (God's beloved), nicknamed Bogusa. Out of her meager income, Jaromirska paid for a girl to look after little Bogusia while she was at work. She somehow managed to support herself and the child as well as to find some money to send packages to her husband. As the Russians approached Leokadia was forced to evacuate. She took the child along and the two wandered from one place to another, constantly searching for food and for a place to sleep. Although conditions were terrible, Bogusia remembered only the warmth and love that Jaromirska enveloped her with. By force of her enormous love, Jarmoirska managed to protect the child from the dangers and the cold, and nursed her when she fell ill. 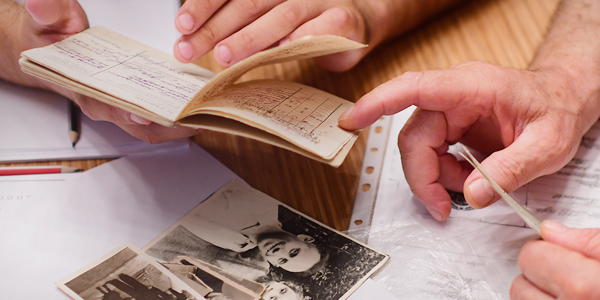 When the war ended, Jaromirska's husband Bolek returned from Auschwitz weak and exhausted. The couple returned to Bialoleka where they lived in a destroyed house and tried to return to normal life. In October 1945 – three years after he had left her near the convent fence, Bogusia's father, Geniuk (Gershon) Jonisz managed to trace her and arrived at Jaromirsk's home. He had survived the ghetto and camps, but his wife had been murdered in Majdanek. Convinced that his baby daughter hadn't survived and that he had lost everything, he decided to leave Europe. He began to make his way to Italy. He later recounted that it was an Italian fortuneteller who told him that "a small soul was waiting for him", that made him retract in the last minute and return to look for his child. Somehow he found Jaromirska, and was able to identify the child through her birthmark. He demanded to take the little girl with him. The idea to part from Bogusia broke Leokadia's heart, and she pleaded with Jonisz to leave the child with her. Eventually she had to give in and was stricken with grief when the child left with her father. Bogusa, whose real name was Shifra Jonisz (later Kocer), immigrated to Israel with her father. When she grew up she became a member of Kibbutz Sha’ar Ha-Golan in the north of Israel. Eleven years after they parted, Shifra began writing letters to Leokadia. Since she had never learned to read and write Polish, she used the help of a Polish speaking Kibbutz member. However it was Shifra’s husband who enhanced the connection to her rescuer. Shifra and her husband Yoram Kocer had three children. It was the husband who began corresponding with Leokadia and asked her to fill in the gaps in his wife's early childhood. It was through this intermediary, that Leokadia told the story of their life together. "Dear Yoram", Leokadia ended her long letters, "I have finished telling my story. It is not my fault that there is not much joy in it. I tried as best as I could because I am unable to touch these matters and open old wounds. But you had asked me to, and I tried to fulfill your request. I know that my story may perturb your tranquility for a long time, and I, too, will suffer the consequences. Now you will not reproach me for being upset that Bogusia is working in the [kibbutz] kitchen. I felt your anger from the first letter. In my eyes she deserves to have a royal crown. But love is the most important thing. You love each other and have your own treasures, and this is worth much more. Because the hand of a child around a mother's neck is the most beautiful necklace, and nothing can replace it. I apologize if something I have said is not to your liking. In November 1968 Jaromirska was recognized as Righteous Among the Nations by Yad Vashem. Again it was Yoram who had invited her to visit them in Israel. But the meeting was never to take place. By the time Jaromirska came to Israel in 1969, Yoram had been killed during his reserve military service. Leokadia came and spent six weeks with Shifra and her family, and the two of them planted a tree in Leokadia's honor in the Avenue of the Righteous at Yad Vashem.